It has been a pleasure to ski Rab clothing for a few years now. My last outfit was the NeoGuide line. It was awesome. A few years ago they gave me the Upslope prototypes to play in. Could it be better? Well, I was stoked to find out so on it went. 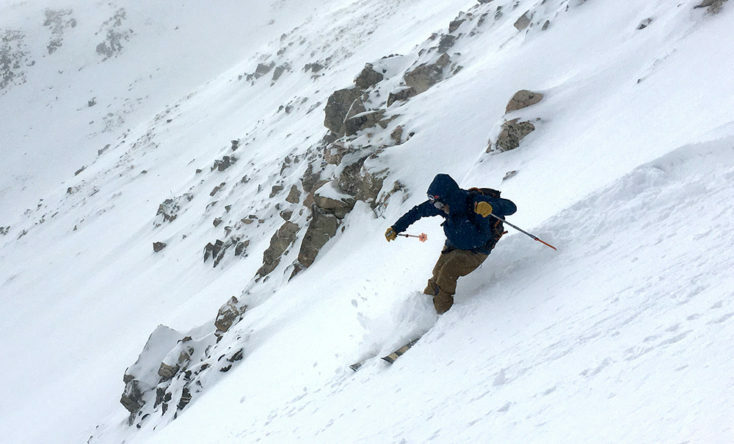 The Upslope is designed with the skier in mind, this from a climber’s company. 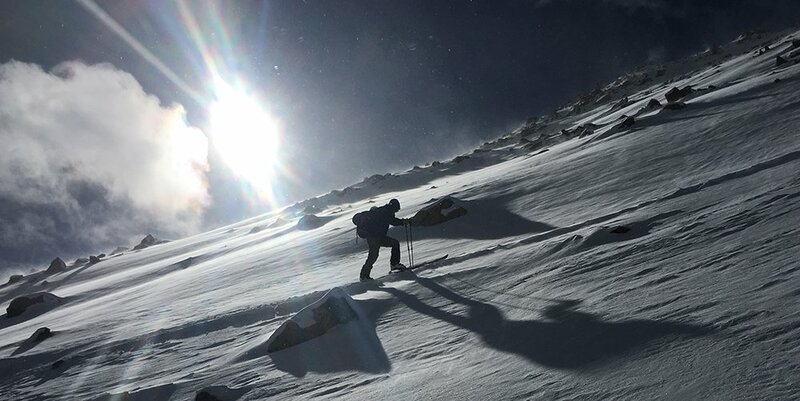 Founded by badass Rab Carrington and tested in the Scottish Highlands where the weather is challenging, to say the least, many think of Rab as being clothes for ice climbing. Well to me this is good; it means that the gear will stand up to whatever you throw at it. How would this carry over to a ski specific garment? 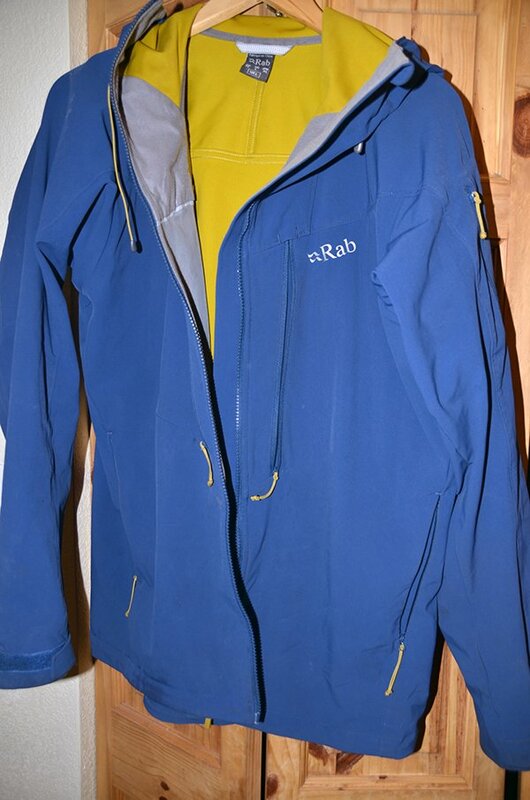 One of the primary features of Rab jackets are the opposing pockets on the exterior chest level. They do this so you have pockets you can access with a harness on. For the Upslope they added standard pockets down at the waist level. This is nice if you’re not skiing with a pack. The pockets act as venting as there are no pit zips. Pit zips can be awkward to use and just unzipping a pocket is so easy. Just don’t lose your keys. The fabric does a decent job stopping the wind on all but the coldest days. As with any shell, I bring a puffy along for layering should the temps get really cold. It’s nice to have layers so you can get the ideal body temp. Going with an insulated coat reduces that flexibility. Usually, I start with both my Upslope and a puffy in the cold morning. As I begin to work hard I get hot and shed layers as needed. Usually, all I need to do is unzip and keep going. The hood is a key element to staying warm on a cold, snowy day. It is plenty big enough to accommodate a helmet and cinches down for when you don’t have your bucket on. When the weather really gets bad you can zip all the way up and be toasty warm on those 70+ mph wind days. The collar has a nice soft liner for your chin and nose when you’re hunkering down in it. The pants have great pockets and a fit that is easier for the skier. If you’re looking at Rab you’re probably going into the hills with pointy tools. The crampon patch is helpful as are the wider cuffs to make getting the pants over ski boots easier. The pockets are great and deep to accommodate maps, compass and other tools for the day. They come with removable suspenders but I’m not a suspender guy so I just use the belt that comes with the pant. The fit is more European so it’s a little tighter but it’s stylish.